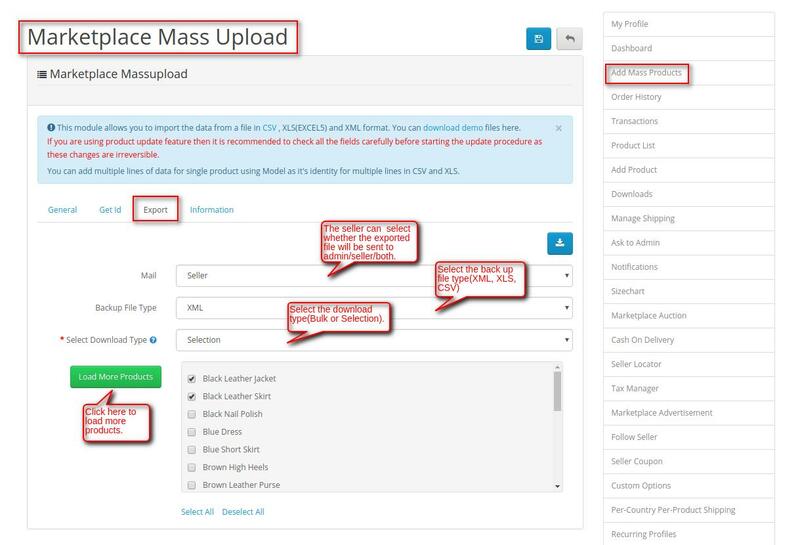 Opencart Marketplace Product Mass Upload add-on is super useful for bulk upload of products. 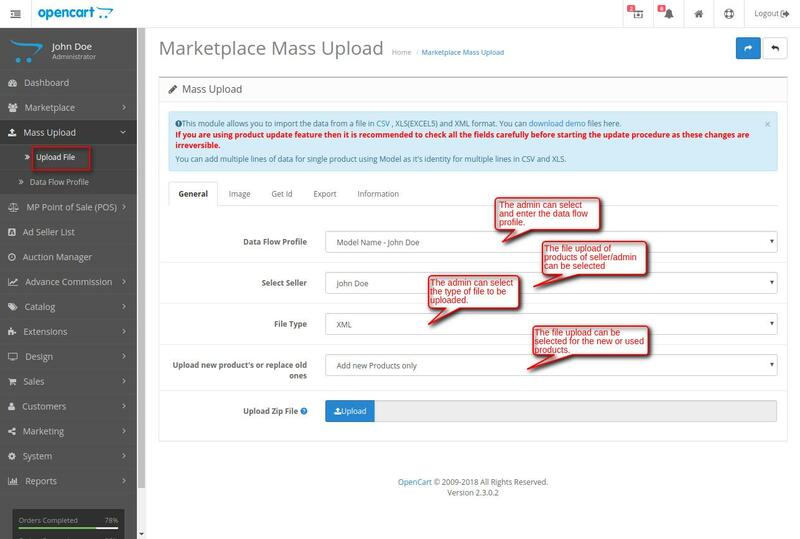 Using this Marketplace add-on, the sellers can upload their products in bulk using CSV, XML, and XLS files also the admin can bulk upload products for himself and into the seller’s store. The admin and sellers will also be able to update their products in bulk and can export their product in bulk or by specific product selection. This module is an add-on of Marketplace Module. To use this module you must have first installed the Opencart marketplace module first. 1. This extension will work with Webkul’s Opencart Marketplace version 2.2.0.0 and above. 2. zipArchive extension needs to be installed in the server. The Admin/Seller can Update Bulk product using the XML, XLS, and CSV file types(in zip format only). The Admin/Sellers can get the ID data of various options like – Product, Catalog, Manufacturer, Filter, Download, Stock Status, Tax Classes, Customer Groups, and Attributes etc. This is a technology-based era where everything is simplified even online shopping. We all know about shopping apps and its advantages-how it reduces and makes our shopping experience hassle proof. So it is very important for all the Store owner to have a shopping app for providing a more convenient way to shop from their online store and now Webkul’s has launched its new app Opencart Marketplace Mobile App. Opencart Marketplace Mobile App converts your marketplace store for Opencart into a mobile app. Your customers can easily purchase products on the go. They don’t need to have a laptop or desktop, they can easily explore your store through their smartphones. It will not only benefit the store owner and customer it will benefit the sellers too. Sellers can see their dashboard, order history through the mobile app. So what are you waiting for, you must now have an Opencart Marketplace Mobile App to be a step ahead. The user can review the seller. 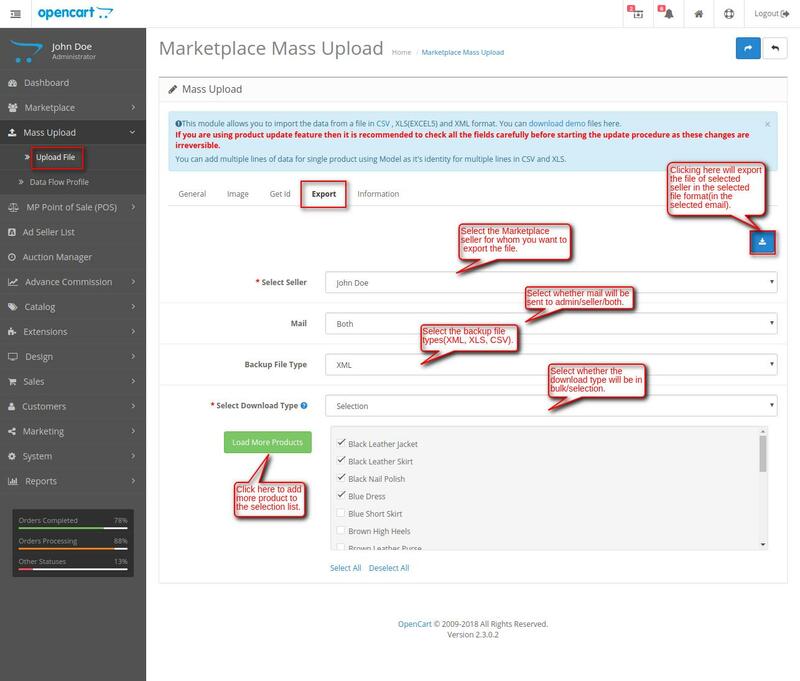 Installation of Opencart Marketplace Product Mass Upload for Opencart is very simple. After extracting the zip file, choose your Opencart Version Folder and in that, you will find folders admin, catalog, and ocmod folders. Now copy the admin and catalog folders into the root directory of your Opencart website. Also, you need to copy the system folder in the Opencart root that you will find along with the Opencart Version folders. If you are using a custom theme like Journal then we provide Journal theme patch (directory) in the module zip. While installing the module, navigate through Theme Patch->Journal2 folder and you will get “Catalog” folder. Just upload the “Catalog” folder into your Opencart root directory for the proper functioning of the module with the Journal Theme. Once you have uploaded the file, login to admin panel and from catalog section go to Extensions> Extension installer and upload the XML file. The XML file can be found in ocmod folder under module directory. Under the ocmod folder, you will find wk_mpmassupload.ocmod.xml file. After Uploading The File Go To The Extensions > Modification and Click On “Refresh“. Now, navigate to Sytem->Users -> Users Group and edit the administrator. Here, under Access Permission and Modify permission click select all for both options and click the Save button as shown below in the snapshot. 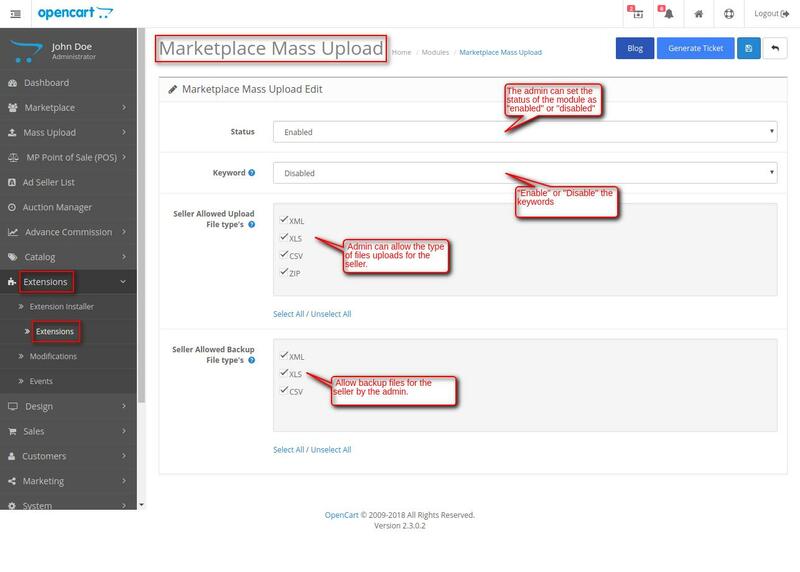 After That Under Extension > Modules, install the Marketplace Mass Upload module like this way. 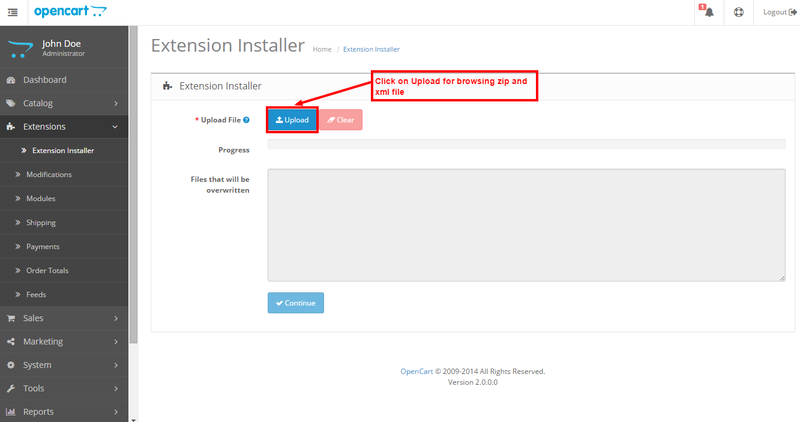 After the installation is completed, the admin can click on the edit button, another page to configure the extension will appear as shown below. If the product is being updated then the SEO will contain SEO+Product Id. If a new product is being added then SEO will contain the provided SEO and random four characters. If the keyword is disabled – The product will be skipped and error will be shown for that product. Set the Seller Allowed Backup Files Types – Allow selective file types to be used by the seller for the backup files upload. Now, navigate through Extensions->Modules->Marketplace and click the edit button. Now, go to the Catalog Configuration tab and under that go to the “Account” tab. Then for the “Allowed Account Menu” click the select all option and then click the Save button to save the configuration. Now, go to the Product tab. Here, only the allowed product fields and the product tabs that are selected by the admin from the backend will be available for the sellers to use while uploading and exporting their products. Using this module, you can allow importing the data from a file in XML, XLS and CSV format. Step 1: To import the products navigate to Mass Upload >General menu option in the admin panel as shown below in the snapshot. The admin can select the Data Flow Profile from the list of dropdown profiles. The admin can set Seller whose products are to be uploaded. Select the File Type as XML, XLS, and CSV. (For the below example, we have used XML file type for importing the products). Select the Option to upload – New Products Only or Update Old Products. Click the Upload button to upload the XML/XLS/CSV file (in zip format only). After clicking the “Next” button, the products will get imported and you will see a confirmation message as per the snapshot below. The admin can upload the images in the Image section of the Mass Upload. Select the seller whose product images are needed to be uploaded. Under this tab, the admin will be able to get the Ids for various fields like Products, Catalog, Manufacturer, Filter, Download, Stock Status etc. After selecting an option, now click on the search box to display the IDs for the selected option. For example – We have selected the option as “Product” and then we clicked on the search box. Now, you can see the Products displayed with their IDs. Similarly, the admin can get the IDs for the rest of the options(Catalog, Manufacturer, Filter, Download, and Stock Status etc). Now, the admin will be able to easily export the products for the marketplace sellers. The admin needs to select the seller, the mail on which the exported file will be sent(Admin, seller, both), the Backup File Type(CSV, XML, XLS), the Download Type(Format of the export file – CSV, XML, XLS), and the Download Type as Bulk(all products of the seller are exported) or Selection(only the selected products are exported) as shown below in the snapshot. After making all the selections above, the admin will click on the Export button to export the products for the seller. After the export, the seller can find the exported file in their email as shown below in the snapshot. Admin can find more information about the module under the Information tab as shown below in the snapshot. On adding the Data Flow Profile, the admin can add the profile name and add the database name and the name as defined in the files. This will help the database to get mapped between the file that is to be uploaded and database of Opencart. Now, after mapping all the fields for the tabs click the “Save” button, after which you can see the success message as shown below in the snapshot. Using this module, the sellers can allow importing the data from a file in XML, XLS, and CSV format under their own account panel. Step 1: To import the products navigate to Add Mass Products > Upload Product > General menu tab under the seller account section as shown below in the snapshot. Select the Data Flow Profile from the dropdown listed by seller. On adding the Data Flow Profile, the seller can set the profiles for which the data needs to be mapped. Select the File Type as XML/XLS/CSV. Select the Option to upload – New Products Only(to upload the new products) or Update Old Products(Update the new Products). Click the Upload button to upload the file with the product data. Click the Upload button to upload the file with the image. After setting up all the parameters, click the “Save” button at the top right-hand side. Now, after clicking the “Save Button” the file will get uploaded and the products will be imported under the “Product List” section of the seller’s account. Under this tab, the seller will be able to get the Ids for Products, Catalog, Manufacturer, Filter, Download, and Stock Status etc. For example – We have selected the option as “Product” and then we clicked on the search box. Now, you can see the product get displayed with their IDs. Similarly, the seller can get the IDs for the rest of the options (Products, Catalog, Filter, Download, and Stock Status etc). Now, the seller will be able to easily export their products. Mail(the e–mail on which the exported file will be sent – Admin, Seller or Both). Backup File Type as – CSV, XML, or XLS. Download Type as – Bulk(all of the products will be exported) or Selection(Selected products will be exported). Similarly, the seller will be able to select the backup file type as – XML, and XLS and the selected file types will be sent via email.